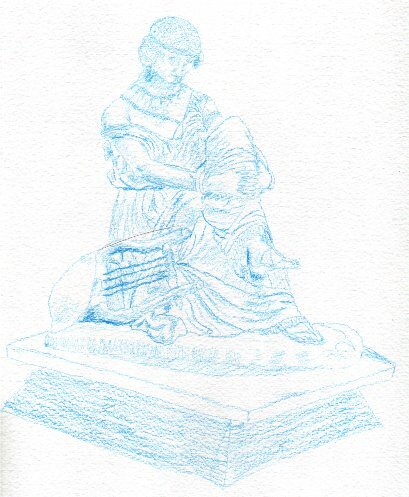 I had the great fortune of sketching some statues in the Louvre and the Orsay Museum. Unfortunately, I didn't bother to get all the pertinent information for all of them. This guy I didn't get the name of, but he was my first sketching attempt. This, of course, is the Venus de Milo. 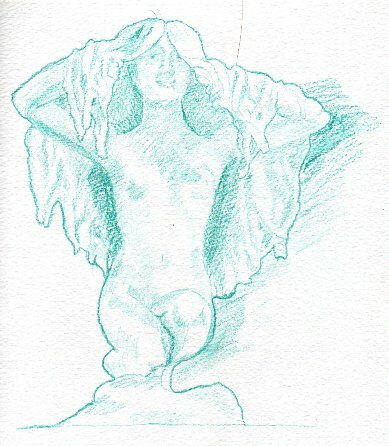 It was difficult to sketch, because she's almost as popular as the Mona Lisa, and so I had to sort of look over crowds to see her, and wait for gaps to sketch her calves and feet. This was called 'Torse de Discobole', though I don't know what that means. The statue had a great shape, although there wasn't much to him. 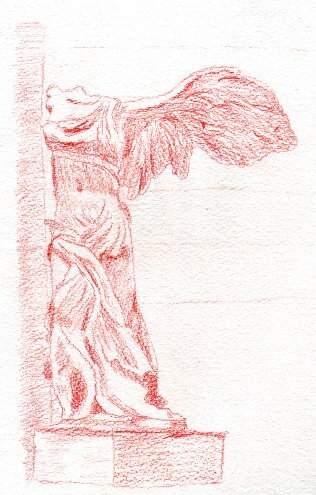 The Winged Victory of Samothrace. I had a lot of fun sketching her. She's magnificent, especially seeing her perched at the top of a grand marble staircase. She actually has two wings, but the angle at which I was sketching, you can't really see the other one. 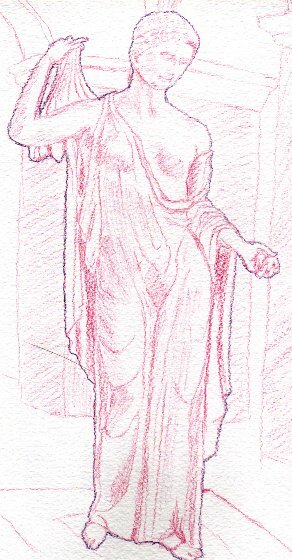 Aphrodite is my favorite. I don't know what it is about her, but I love her. She is also the closest to reality of any of my sketches. The statue actually looked like this. I was stunned. This was a big pain to sketch, but it turned out pretty well, considering I didn't have a ruler with me. Although, I think even if I had had a ruler, it still would have been lop-sided. 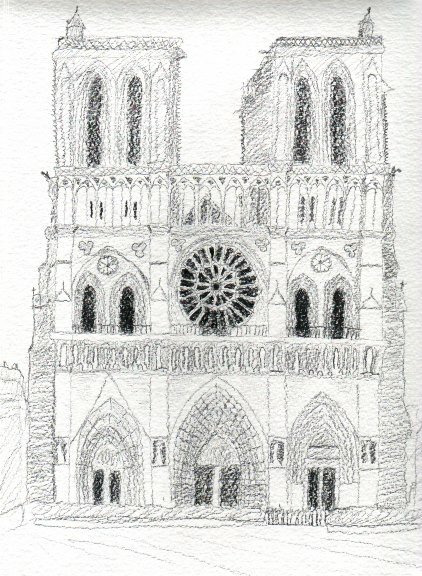 I sketched this at 7:30 in the morning on my birthday, in the bright morning sun, and was awed by the detail of the building. The only thing more beautiful than the outside of this building is the INSIDE. Of course, it's really hard to effectively sketch dark interiors with stained glass windows when you only have a black sketch pencil. Sapho was the first of many statues that touched me in this amazing museum. She's very sad looking. Pensive, even. She isn't my best work, but she is a worthy effort, and I don't want to forget her. Aurore is an adorable statue. She has the most precocious expression on her face, which you almost can't see, because she's got so much hair in the way. Again, not my best work, but still a lovely thing. 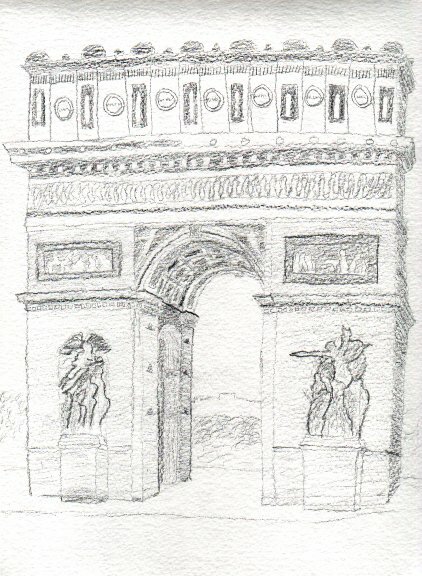 Alas, there were several other statues I wanted to sketch, but the rest of Paris beckoned.